Bournemouth have completed the signing of Torquay United's 22-year-old midfielder Eunan O'Kane for an undisclosed fee in a three-year-deal. O'Kane played 51 times for League Two Torquay last season. Last month O'Kane, who had a £175,000 release cause in his contract, turned down the chance to join Crawley. "Crawley had an offer accepted so I went and met them but turned them down as I didn't feel it was right for me," O'Kane told BBC Radio Solent. 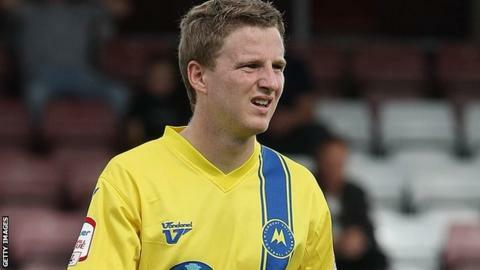 He joined the Gulls from Northern Irish side Coleraine in January 2010 and was one of four Torquay players to make the League Two team of the season. Bournemouth like to play through midfield and that is perfect for me, it's the way I believe football should be played. He has played 122 times for the club, scoring 14 goals and says Bournemouth's reputation for playing passing, attractive football was a major pull. "It hasn't really sunk in that I've signed. I met the manager Paul Groves and he sold the club to me," he added. "The type of football Bournemouth play was attractive to me but also their track record of developing players and moving them onto a higher level so hopefully I can follow that on. "They like to play through midfield and that is perfect for me, it's the way I believe football should be played." O'Kane, a creative midfielder, says he was impressed by Bournemouth's ambition and hopes he can help them achieve promotion this season. The former Everton trainee will compete with Shaun MacDonald and Harry Arter for a starting position. "When you go to a club you want to know they are financially sound. They have spent a lot of money bringing players in," he said. "I loved Torquay and the place and people, there was no reason to move, but as a footballer I want to play at the highest level I can so I had to move on. "You want to play at the highest level possible and hopefully I can do that with Bournemouth. "Things went really well at Torquay and I hope they have every success but it was the right time to move on and I just can't wait to get into things now."